Bad Schönborn is a spa town in the northwest of Baden-Württemberg in the administrative district of Karlsruhe. It has 12.000 inhabitants and is known for its sources of sulphur and brine. Bad Schönborn has only existed since 1971: back then, the two villages Bad Langenbrücken and Bad Mingolsheim had been joined in a community reform. The history of both villages reaches back into the middle ages. Mingolsheim was already documented as early as 773, Langenbrücken in 1269. Archaeological findings have suggested though that people have been living in the area in the early Iron Age already. Both boroughs belonged to the cathedral chapter of Speyer for centuries and thus have a Catholic imprint. Langenbrücken developed into a spa first, when prince-bishop Franz Christoph von Hütten had a sulphur bath built there in 1766. Mingolsheim only operated as a spa after 1930. After World War II, almost 600 Danube Swabians from Ratkovo (Serbia) came to the region. After years on the run and in refugee camps, they were given the support of Langenbrücken’s mayor and a chance to start anew. They built houses there; most of them constructed them on their own and with the help of their friends. Thus, they built a residential area and gave it the name “Batschka”. In 1987, a city partnership with their hometown Ratkovo was established. On this basis, the Danube Swabians created a heritage museum in 1994. 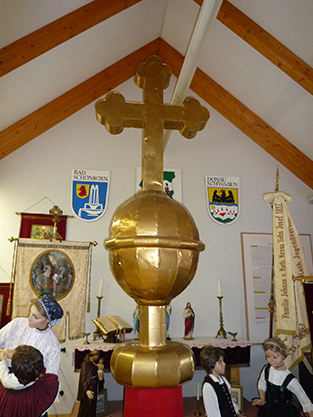 It gives information on the Danube Swabians from Ratkovo from their settlement there until World War II. Objects on display are for example a large model of the parish church, religious items, folklore costumes, furniture and machines for craftsmanship and agriculture. For a long time, the Danube Swabians of Bad Schönborn did not have any contact to their hometown. Nowadays, however, they are organising travels and are even taking people from their grandchildren’s generation along. More and more encounters between former and modern inhabitants of Ratkovo are beginning to grow into friendships. Church spire of Saint Nepomuk in Ratkovo, around 1910. 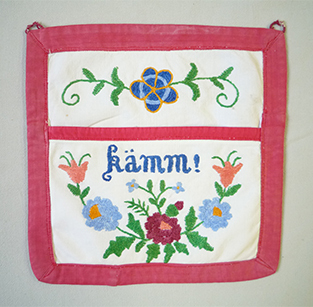 Wall pocket for combs, around 1940. Opening hours: every Thursday and first Saturday of the Month: 3 – 6 pm or on previous notice.